Pays Rs. 11.5 bn or 41% of profit as taxes to Govt. Gross income increased by a healthy 24.10% to Rs. 115.594 billion, bolstered by interest income of Rs. 103.034 billion, up Rs. 22.296 billion or 27.62% primarily due to a significant growth in the Bank’s loan book over the 12 months. Sri Lanka’s benchmark private bank paid approximately 41% of its profit to the Government as taxes in a year of volatility and headwinds, but posted typically robust growth in all key performance indicators to end 2017 on steadfast note. Profit before income tax grew by 15.62% to Rs. 23.183 billion, the lower rate due to the impact on the full year of the November 2016 increase in the VAT rate from 11% to 15%. Profit after tax for the year improved by 14.25% to Rs. 16.581 billion, the Bank reported in a filing with the Colombo Stock Exchange (CSE). 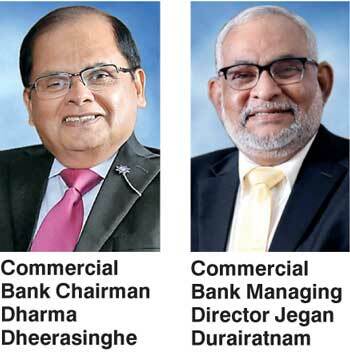 Commenting on these results, Commercial Bank Chairman Dharma Dheerasinghe said they demonstrate the Bank’s capacity to further financial inclusion within Sri Lanka and grow beyond the country’s shores both regionally and internationally, if additional tax burdens are not imposed. He noted that the Bank paid out approximately 41% of its profits as taxes in addition to over Rs. 2 billion it had collected from customers on behalf of the Government in 2017. Managing Director/CEO Jegan Durairatnam pointed out that the growth of deposits and credit in the concluded year reflects the Bank’s strong capacity for financial intermediation, and illustrates a deployment of funding resources that is most conducive to the pursuit of productive assets. “Additionally, a further improvement in asset quality with both gross and net non-performing loans ratios decreasing, boosted profitability,” Durairatnam said. Total assets of the Bank grew by Rs. 131 billion or 12.96 % at a monthly average of Rs. 11 billion to Rs. 1.143 Trillion as at 31 December 2017. Net loans and receivables increased by Rs. 121.428 billion or 19.71% over the 12 months of 2017 to stand at Rs. 737.447 billion at the end of the year reviewed, recording an average increase of more than Rs. 10 billion per month. This was the third successive time that Commercial Bank increased its loan book by more than Rs. 100 billion in a year. The Bank’s deposits portfolio witnessed a growth of 14.95% or Rs. 110.564 billion to Rs. 850.128 billion as at 31 December 2017, reflecting average monthly growth of over Rs. 9 billion. This was the second successive year in which the Bank’s deposits grew by more than Rs. 100 billion. In other performance indicators, the Bank improved net interest income by 18.89% to Rs. 39.023 billion, more than double the rate of growth achieved in 2016, despite interest expenses growing by 33.59% to Rs. 64.011 billion due to rising interest rates and a continuing shift of low cost funds to fixed deposits in 2017. Net fees and commissions totalled Rs. 8.602 billion for the year, reflecting growth of 22.62%. Other income comprising of exchange profit, recoveries and gains from trading of treasury bills and bonds declined to Rs. 2.390 billion, mainly because the 2016 figure included translation gains due to a depreciation of the rupee against the US dollar by 3.88% as against a 2.57% depreciation in 2017. Consequently, total operating income grew by 13.41% to Rs. 50.016 billion in the 12 months reviewed. Net operating income grew by 12.99% to Rs. 48.102 billion, with total expenses increasing by just 6.49% to Rs. 20.038 billion. Total impairment charges for loans and other losses were increased by 25.13% to Rs. 1.914 billion mainly due to the collective impairment provisions required on the growth of the loan book in 2017. Shareholder funds grew by Rs. 28.746 billion or 36.69%, consequent to the rights issue of shares, a reversal of mark to market gains on the Bank’s Available for Sale (AFS) portfolio due to a drop in rates in the market, and a once-in-three-years revaluation of the Bank’s land and buildings in line with accounting standards. The Bank’s net assets value per share stood at Rs. 107.54 at the end of the year, an increase of Rs. 19.57 or 22.25% since December 2016. Return on assets after tax improved marginally to 1.54% while return on equity declined to 17.88% because the year-end shareholder funds base increased. In terms of Capital Adequacy Ratios, the Bank’s Total Tier 1 capital ratio (with capital buffers) at 12.11% as at 31 December 2017 was well above the 7.75% required under Basel III. The Total Capital Ratio of 15.75% at the end of the year was also comfortably above the Basel III requirement of 11.75%. At Group level, Commercial Bank, its subsidiaries and associates reported profit before income tax of Rs. 23.280 billion for the year ended 31 December 2017, an improvement of 15.74%. Profit after tax for the year grew by 14.93% to Rs. 16.627 billion. Among the highlights of 2017 for Commercial Bank were its investments in digital banking and the performance of its overseas operations. While the Bank’s Bangladesh operations performed characteristically well, its joint venture Bank in the Maldives broke even, opened a second branch on the island of Hulhumalé and is now making a positive contribution to the Bank’s profitability. In Myanmar, the Bank received a microfinance license in 2017 and formed a fully owned subsidiary, CBC Myanmar Microfinance Company Ltd., while in Italy, Commex Sri Lanka S.R.L., the Bank’s money transfer operation, increased its presence to eight cities besides Rome. The only Sri Lankan bank to be ranked among the Top 1000 banks of the world for seven years consecutively, Commercial Bank operates a network of 261 branches and 756 ATMs in Sri Lanka. The Bank has won more than 30 international and local awards in 2016 and 2017 and has over the years received multiple awards as Sri Lanka’s Best Bank, Best Trade Bank, Strongest Bank and Most Respected Bank from a number of local and international institutions and publications.